Here I sit in my nearly 90 degree house, on my birthday/holiday weekend, while the A/C guy puts a new compressor in my 6 year old A/C unit. And while the title of this post may not reflect my sincere appreciation, Mike at Arizona Refrigeration Service is definitely my hero today! In fact, my entire family is soooooo thankful to have our new compressor installed today, instead of Tuesday or "next week" like every other place in town told us. Okay, so I'm really in my basement, where our other A/C unit does work and things could definitely be worse. But I still felt the need to blog about my air conditioning ordeal because being a real estate agent married to a home inspector, we pretty much thought we were prepared for anything house related. But Friday morning when the A/C died, we quickly found out that we were not. My husband was already at work and the kids had just left for school when I noticed that our kitchen was much hotter than normal. I looked at the thermostat and it was 85 degrees in the house, even though our A/C was set to maintain a temperature of 80 degrees that time of day. I couldn't understand why the A/C was not coming on and cooling the house, but I could hear that it was definitely not running at all. So I turned it off and waited a few minutes and then turned it back on...nothing. I set the temperature way down low to try to force it to turn on...still nothing. I was praying so hard that we just needed a new thermostat or something simple since the unit wasn't trying to turn on at all. So I called my husband and luckily, he was able to stop by the house within a few minutes. After looking at the compressor, he realized that the circuit had been tripped so he reset it. As soon as he did, the compressor came on for about a half second and then made a terrible noise. I didn't know what the noise was, but even I knew it was NOT a good noise! This would be the last noise that particular compressor would ever make - it was completely fried, and this was not a happy moment in the Hubbard household! Normally, when something breaks in our house, my husband the home inspector diagnoses and fixes the problem himself. It's much cheaper and we usually get a higher quality result than if we were to call a repairman. Okay, sometimes I have to wait a while for the not so high priority repairs (wants, not needs!). But for the most part, things in our house get fixed and we don't pay other people to do it. However, there are limitations to what my husband can do, and for some jobs it simply doesn't make sense to do-it-yourself. The A/C is one of those repairs you just can't do yourself. Even if he felt confident in his HVAC skills, he doesn't have the proper tools and I don't think you can even buy the freon and other necessary parts without being certified/licensed. Anyway, knowing his limitations, my husband quickly diagnosed the bad compressor but said we needed an A/C company to install a new one. So he called several air conditioning companies he knows, but nobody could even come out for a service call the same day. And although we already knew what needed to be replaced, we also knew the A/C repairman would still have to come out for a service call to diagnose the problem as a first step. And of course, my husband wanted his diagnosis confirmed since he is not an HVAC specialist. But then before our A/C would work again, the repairman would have to go get the part and come back out another time to replace it. Being Friday morning, we were majorly fighting the clock. We finally found somebody that could come out between 2PM and 4PM....just before the end of business hours for the long weekend. How convenient - that would leave us with what - perhaps a split second to decide whether we wanted to spend a couple thousand dollars or go all weekend without an A/C. Of course, there would be no time for second opinions/estimates or due diligence...just take it, or leave it and be hot all weekend. I was completely uncomfortable with the whole situation because I do not like to spend that much money without doing some research, getting competing bids, etc. But there was no time for that today. We were just happy to have someone coming out before the weekend. My husband knew it wasn't going to be cheap, but didn't know exactly how much it should cost. But knowing the problem was half the battle, because like many repairman, the A/C guy could have taken me to the bank and I would've probably thanked him for doing it so quickly! Considering the timing, even a not so bright A/C guy could've figured out that I was going to pay whatever I had to pay to get my A/C fixed ASAP. Knowing that the compressor needed to be replaced gave me a starting point to find out what I should be charged before the repairman arrived. Having a ballpark figure would at least allow me to know if I was being completely ripped off because I was between a rock and hard place. So I called several A/C companies from the yellow pages/internet to get estimates on the installation of a new compressor for a 4 ton Carrier ground A/C unit. Most would give me a rough estimate over the phone since I knew exactly what I needed. Some would not give phone estimates so I quickly scratched them off my list and moved on to the next company. After speaking to several companies, I now knew the repair should cost between $1500 and $2300, and I would not be blind-sided by a greedy repairman's estimate. By making these phone calls, I also learned A/C Repairman MYTH #1: No matter what their advertisement says, you are NOT getting your A/C fixed today. Okay, in all fairness, maybe if it was just a minor repair or you needed freon added, it might happen today. But otherwise, find a cool spot to wait - it's not getting fixed today. I must have called more than 20 companies that said "One-hour response", or "Same day service guaranteed" or "24 hour emergency service" or the like...not one of them meant it. Yes, they could come to my house to look at my A/C the same day, but unless they could get my A/C working the same day, their "same day service" was pretty much worthless to me. This leads me to A/C Repairman MYTH #2: No matter what their advertisement says, you WILL pay more for after hours service. They may not call it an "emergency service fee", but most of the companies that had weekend and/or after hours service gave me much higher quotes than the other companies. Speaking of the companies that I called for estimates, I would like to mention one company that really stood out. In fact, I really wanted to use this company (who could come out the same day), but they do not serve Mesa, which is where I live. The company is called Economy Air Conditioning & Heating and Pam was the person I spoke with. Anybody who has called around for any kind of estimate knows there are the really friendly companies who take the time to answer your questions and give you that warm fuzzy feeling, and then there are those companies that sound like you're bothering them by calling. And I tend to ask alot of questions, so I really bother those companies that already seem bothered! That's one way I rule out companies. If they don't sound happy to talk to me, I call someone else. If they don't want to take the time to answer my questions, someone else will. So anyway, I called Economy Air Conditioning & Heating and spoke with Pam. Their quote was $1250 - the lowest, and the only quote under $1500. But as I went further to set the appointment up, that's when I found out they don't serve Mesa (they do serve Phoenix, Scottsdale, the north Valley and the west Valley). Even after Pam realized she did not serve my area, she was willing to keep talking to me - imagine that! In fact, she was the most helpful person I spoke with all day. She told me if I gave her the serial# and model# from the A/C, she would check to see if it was still under warranty for me. She also told me some Carrier compressors were back-ordered 2 weeks out, so she would check to see if there were any in town. All of this, again, AFTER she realized they did not serve my area! And she did call for me and found out that there was only one of the compressors I needed left in my area. She put it on hold in my name and then called me back to let me know that any A/C repairman I chose could pick it up! She also told me the place closed at 5PM and would not be open tomorrow. This was all really good stuff to know, so Pam was very helpful even though she didn't have to be. I'd also like to add a note about phone estimates...I've gotten them before and I've found that most companies will low-ball the estimate over the phone so that you will have them come out to your house. Once there, the written estimate will usually increase. So I had to figure whatever estimate I was getting on the phone was on the low end and would likely go up. Likewise, the roughly $1600 written estimate I first got from Arizona Refrigeration Service didn't include sales tax or the service call, so it quickly went up about $200 once those were added in. I wasn't too upset because realistically, I would've expected most of the phone estimates to go up at least that much once they came to my house too. I was also fairly comfortable with Arizona Refrigeration doing the repair, as they are a reputable company. Honestly, I would've preferred to go with a smaller, perhaps family-owned company, however those companies are usually booked several weeks out and do not have the manpower to respond quickly. So in this type of situation, I really had no choice but to go with a larger company. It's hard for me to even acknowledge how caught off guard we were by our compressor going out. The house is only about 6 years old so it is not an old unit, relatively speaking. Of course, our original A/C was warrantied for 5 years, so we should have known it would only last 6 years or so - that's usually how it works! Yep, those manufacturers know exactly when their products will fail, and the warranty usually expires just before that. There were no signs that we could have seen to know our compressor was about to fail. Even Mike, the A/C repairman, said there is no routine service or inspection that would have caught or prevented this problem. It was a defective plug that blew out and fried the compressor without warning. 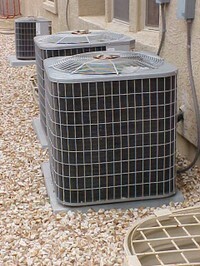 We used to buy and renovate properties in the Valley for a living, so we have replaced A/C units in the past few years. In fact, we just replaced a unit at our office less than 2 years ago. And being a real estate agent married to a home inspector, we should and do know plenty of reputable A/C companies to call, but none of them could accommodate our needs on the tight schedule. So no matter how prepared you think you are, if your A/C breaks during the hot Arizona summer (and it will - Murphy's Law! ), you will be completely at the mercy of an A/C repairman! While you may have the time, you will not WANT to take the time to get several estimates the way you should when you're spending a bunch of money. In the end, we used Arizona Refrigeration Service because we really had no choice - they could do it at least 3-days sooner than anyone else and their price was reasonable compared to other companies. They got the part that was being held in my name last night, and Mike came back out this morning to install it. Mike was a nice guy, professional and seemed to know what he was talking about. Perhaps we could've saved a little money by waiting, but we decided that our family's comfort over the long holiday weekend was also worth a certain amount. Overall, I am upset our compressor went out when it did, but I feel the outcome was about as good as could be expected. One thing I am a little disappointed in is the warranty. Arizona Refrigeration Service only gave us a 1-year parts and labor warranty on the new compressor, and apparently the manufacturer doesn't warranty the new compressor at all...huh? So to me, that means we could be doing this again in 366 days! And with a total of 3 A/C's in our house, this could get expensive real quick. But come to find out, our 1-year warranty is better than the 30-day warranty some other companies offer. So a couple thousand dollars and 1.5 wasted days later, I guess we could've done worse. My Dad was right (as usual!) when he told me that TRANE is by far the best A/C available. He's owned many homes and he's always been a do-it-yourself type person who can fix anything himself, so I trust his opinion. My husband, Scott also shares this opinion, and as a Home Inspector, he should know. Also, of all the homes we've lived in, this is the first one that does NOT have a TRANE air conditioner, and it's also the first house we've ever lived in that needed A/C repairs. So be sure to keep that in mind when you buy or build your next home or commercial property, or the next time you have to replace an A/C unit! By they way, HomeInspectionBlog.com has a great article about air conditioner maintenance tips and warning signs that my husband wrote a few months back. Stay cool!